Trying to reach Gerardo...sent an e-mail and PM with a couple questions on a steering wheel. I have a 99 C5 Coupe with an oak/blk interior and want to do something in leather on the double din radio bezel (from DD Mods). I would send you my bezel and the small t/c piece. I want to do something in black leather with contrasting oak tan stitching. Can you give me some pricing and delv on the following listed below. I'm enclosing some pics of my car to give you an idea of where I'm at. you). Darkest black subtle pattern is preferred. leather, all with oak tan stitching. As you can see from pics attached, I have some Carskinz pieces but I'm very hesitant about sending them my bezel due to poor customer service, so please advise. Also, I have armrests, shift boot, and ebrake in black leather w/tan stitching so I want to finish the bezel the same way. option 1, that's my main goal. 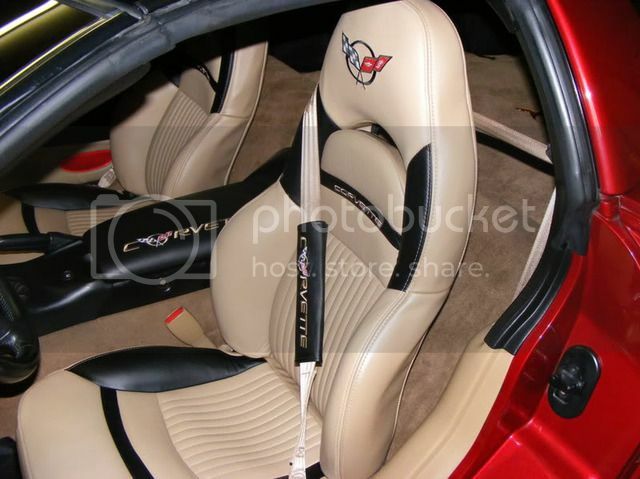 Ordered armrest covers at Corvettes at Carlisle. Any idea when they will ship? Hey Gerardo. I have an 08 Zo6 but the 2LZ package. I noticed the driver side door is a little different. Is it the same price? I am interested in purchasing the driver and passenger side. This year we are doing Houston Corvette Show, Tennessee Corvette Show (possibly), Texas Motor Speedway Show Dallas, Strictly Corvette Show Atlantic City, Bloomington Gold Show Chicago, Corvettes at Carlisle, SEMA Show Las Vegas. As of the moment, these are the show we have scheduled.